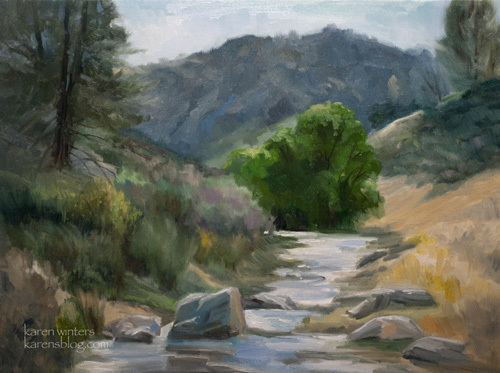 Last summer we spent several pleasant days with other California Art Club artists at the Rankin Ranch in the Southern Sierra in Kern County. This oil painting was inspired by that trip. The hills are used for grazing by the range cattle owned by the ranch. This small stream serves as a water source for part of the herd. The tree growing by the water didn’t seem to be a willow, but no doubt it was a water-loving species. I liked the way it made a spot of lush green among the dusky tones of the surrounding hills. The area is not far from Bodfish, Caliente and other Southern Sierra towns. Wicked looks amusing my partner and i dnt tink diz ipad tablet is intended intended for people Simply no outer units just apps but apps imply Additional money to enjoy, so this will be the most severe thing. . -= GDI Blog’s final website… Discover Great Injury Rates along with Handle Your Business =-.